As the weather warms and the days grow longer, Downtown Florence is alive with shoppers, diners, workers and the pale faces of sunlight deprived southerners who have been aching for their slow, sticky hot summer days to begin. You can almost see the citizen's sighs of relief as bare winter gives way to the beautiful spring colors of green leaves lining Downtown Florence sidewalks and bright colorful window displays beckoning strolling pedestrians to walk inside the diverse mix of shops. With each new door opened browsers will find spring's new assortment of goodies from market and a far reaching palette of tastes representing an eclectic mix of the worlds population. Spring is representative of new beginnings, a fresh start. 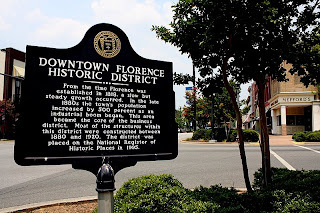 What better time to start your relationship with downtown Florence. Connect with her history and write her future.